July 1992 saw our first grain harvest. The seed had been sown in the previous October by Alvaro Venturini, our predecessor in Podere Il Casale. In our biological farming concept with balanced results, four hectares of land yielded about 10 tonnes of durum wheat We delivered this to the local Consorzio Agrario, the agricultural cooperative. The price was only established in September and then it only brought in 25'000 lire per 100 kilos, corresponding to 30.00 Swiss francs! For us this meant that with growing wheat we could hardly cover our expenses. It was impossible with such a market price, to cover the costs for seed, fertilizer, diesel oil, machinery and salaries. So we had to work out an urgent solution. 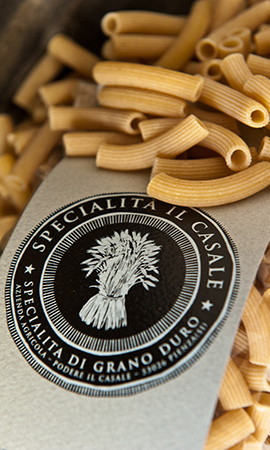 From our deliberations came the idea of having our own pasta made, the pasta of a family farm outstanding for its quality. 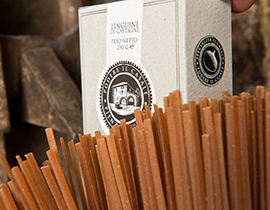 Detailed research led us to Gianfranco Zaccagni, who with his one-man business in the Abruzzi, continued a family tradition of several generations and who passed on valuable information to us concerning the production of pasta. According to Zaccagni's firm conviction, it is the purity of the water and the gentle drying method of the pasta, besides the quality of the wheat, which play a prime role. In addition, the master claimed that nothing could surpass his pasta machine of over a hundred years old. Thanks to the old method of alloys, a better temperature is created that is more favourable for the formation of dough. The machine mixes the grist with the water and kneads the dough until it is ready for pressing through the form. Not to forget that when drying pasta, the temperature of 40° must not be exceeded. 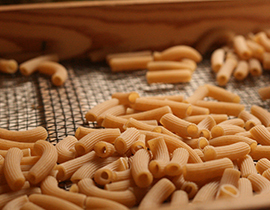 Pasta produced in this way has at least three advantages over that produced industrially: it is easier to digest, has a stronger wheat flavour, and thanks to its greater porous quality, enables sauces to adhere more easily. Gianfranco Zaccagni also brought us up to date with the history of pasta production in Italy. We learned that before industrialisation, pasta was always smooth. The adoption of new stainless-steel and teflon utensils, as well as the fast drying method of up to 100° centigrade, were reasons why the surface of industrial pasta remains very compact and the sauces are unable to adhere. This is why the ridges, rigate in Italian, found on industrial pasta, are added in order to create more surface for better sauce adherence. Following the death of Master Zaccagni, we were lucky to find a no less experienced and competent partner in the Pastificio Verrigni in Rosetano Abbruzzo. But of course, a pre-requisite in good pasta production is a good mill. The family business Silvestri with master-miller Tigelino in Torgiano near Perugia fully satisfied our demands. With on the one hand, the most modern machinery for the white flour, and on the other hand with ancient millstones for the wholemeal, the wheat is put through a gentle milling process. A small secret that we are pleased to divulge here lies in what we deliver up exactly to be milled. Seeing that we include the wheat germ, our pasta comes out darker than usual. By adding this ingredient, we obtain a grist which carries not only a higher nutritive value but above all brings a much better taste on to the plate.